MIAMI, FL — September 17, 2018 — Miami Cancer Institute, a next-generation cancer treatment destination and Florida’s only member of the Memorial Sloan Kettering (MSK) Cancer Alliance, proudly announced today that Albert H. Nahmad has been named chair of the Institute’s Board of Directors. He succeeds S. Lawrence “Larry” Kahn III, the Institute’s visionary, founding Board chair and founder of Coral Gables-based Lowell Homes, who recently passed away following a long battle with lymphoma. Mr. Nahmad shares Mr. Kahn’s passion for philanthropy and a desire to continue to help elevate Miami Cancer Institute as a cancer treatment destination both here in Miami and in neighboring regions. 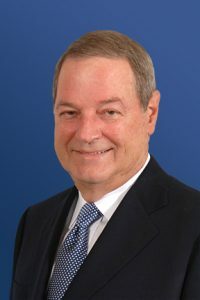 Since 1973, Mr. Nahmad has served as board chair and CEO of Watsco, Inc., an NYSE company based in Coconut Grove. At the beginning of his tenure, Watsco had revenues of $5 million and a market capitalization of less than $5 million. Under his strategic leadership, Watsco has become the largest distributor of air conditioning, heating and refrigeration products with revenues of over $4.5 billion and a market capitalization of nearly $7 billion. Watsco’s success has been achieved with a conservative, long-term focus and an entrepreneurial spirit. The company operates from 568 locations in the United States, Canada, Mexico and Puerto Rico and also serves markets in Latin America and the Caribbean. He holds an M.S. in Industrial Administration from Purdue University and a B.S. in Mechanical Engineering from the University of New Mexico. He maintains an active role in a number of charitable organizations in South Florida. In his role as chair, Mr. Nahmad sits with current board members Phil Conway, secretary; Ronald A. Shuffield, treasurer; and Bruce Beal, John Dasburg, John Haley, Michele Kessler, Patrick P. Lee, Rudy Kranys, and the Rev. Dr. William White. Miami Cancer Institute is a next-generation cancer treatment destination known for its leading clinical care and research, compassionate patient experience and state-of-the-art technology – including the first proton therapy center in South Florida, Latin America and the Caribbean, and the only radiation oncology program in the world with each of the latest radiation therapies in one place. The Institute offers an impressive roster of established community oncologists and renowned cancer experts, clinical researchers and genomic scientists recruited from the nation’s top cancer centers. As Florida’s only member of the Memorial Sloan Kettering (MSK) Cancer Alliance, Miami Cancer Institute is part of a deep and functional collaboration that affords patients access to innovative treatments right here at home and ensures that the standards of care developed by our multidisciplinary disease management teams match those at MSK. Heralded nationally as one of the “hybrid” cancer centers of the future, Miami Cancer Institute combines high-quality community-based cancer care with the best of an academic cancer center, including innovative clinical trials tied to research and genomics and disease-specific surgeons, medical oncologists and radiation oncologists who are experts in their fields. For more information, visit MiamiCancerInstitute.com. Miami Cancer Institute is part of Baptist Health South Florida, the largest healthcare organization in the region, with 10 hospitals (Baptist Hospital, Baptist Children’s Hospital, Bethesda Hospital East, Bethesda Hospital West, Doctors Hospital, Fishermen’s Community Hospital, Homestead Hospital, Mariners Hospital, South Miami Hospital and West Kendall Baptist Hospital), more than 40 physician practices, 50 outpatient and urgent care facilities, Baptist Health Medical Group, Baptist Health Quality Network and internationally renowned centers of excellence spanning Monroe, Miami-Dade, Broward and Palm Beach counties. A not-for-profit organization supported by philanthropy and committed to our faith-based charitable mission of medical excellence, Baptist Health has more than 19,500 employees and more than 3,000 affiliated physicians. Baptist Health has been recognized by Fortune as one of the 100 Best Companies to Work For in America and by Ethisphere as one of the World’s Most Ethical Companies. For more information, visit BaptistHealth.net/newsroom and connect with us on Facebook at facebook.com/BaptistHealthSF and on Twitter and Instagram @BaptistHealthSF.